Dr. Syamlal is the Research Fellow for Computational Engineering at the National Energy Technology Laboratory. at National Energy Technology Laboratory. Dr. Syamlal is responsible for the development of science-based simulations that span a broad range of scales and for applying them to accelerate energy technologydevelopment. His degrees are in chemical engineering: B.Tech from IIT (BHU), and MS and PhD from IIT, Chicago. He was the initial architect of the widely used open-source multiphase computational fluid dynamics code MFIX and led the development of software for linking process- and device- scale simulations and the C3M chemical kinetics software. He was the founding Technical Director of Carbon Capture Simulation Initiative. 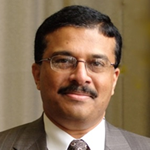 He is a fellow of AIChE and the recipient of numerous awards such as DOE Secretary’s Achievement Honor Award and AIChE’s Fluidization Process Recognition Award.